For just $0.99/month, you can receive all of 1&1’s easy to use services for a refreshing hosting experience. Unlike most inexpensive webhosting services, though, 1&1 will give you access to a huge list of the most popular apps that webmasters love. Even if you want to build your site entirely on your own, you’ll have access to 1&1’s handy website builder, which could have you up and running in no time. 1&1 also takes pains to make sure your site is secure and available for all your customers, no matter when they access it. You’ll also have access to tons of SEO help, both in handy guides to optimize your site and in the form of add credits to drive traffic to your site. No matter how you look at it, 1&1 is a great place for first-time webmasters to learn and grow online. And, with a 30-day money-back guarantee, you’ve got nothing to lose by giving 1&1 a try today! 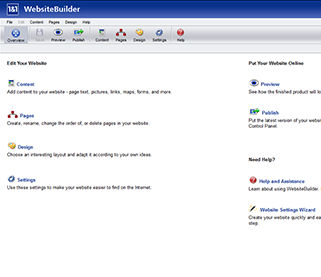 With a simple template-based web builder, you’ll have your site’s design at your fingertips and ready to go at moment’s notice. 1&1 lets you choose from a wide variety of prebuilt templates, so all you have to do is input your own text and graphics to complete your site—which could be done in minutes. 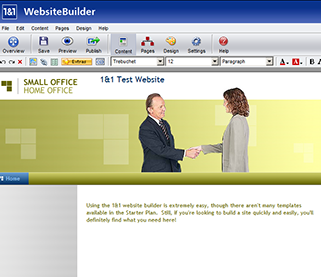 Even if you’ve never built a website before, 1&1’s site builder should still be incredibly straightforward to implement. Offering 10GB of storage for its introductory package, 1&1 will likely provide more storage than you even need, but can still be ratcheted up to more storage as your site grows. No matter what package you choose, though, you’ll receive unlimited transfer, meaning you won’t be penalized if too many people visit your site in a certain time frame. 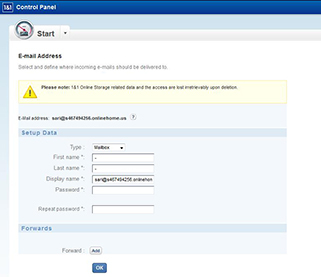 Geo-redundancy is a handy feature that essentially hosts your site on multiple servers around the world, ensuring that your site will load even if one server fails. 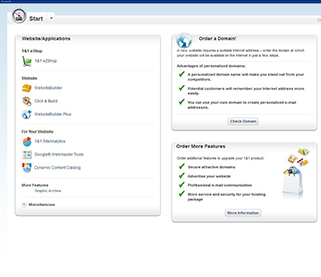 1&1’s hosting provides excellent features, including an exhaustive list of the most popular 3rd party applications. If you want to easily install WordPress, Drupal, Joomla or Magento, then 1&1 definitely offers a packages that can meet your needs. You’ll also have the choice between Linux- and Windows-based hosting, depending on your preference and operating system. For people who want to code their sites, all of 1&1’s hosting packages will support PHP 5.5, one of the most popular coding languages in use today. If you want to use other languages, like Perl, Python or Ruby, you’ll probably want to investigate 1&1’s affordable premium packages. Either way, you’ll have access to more than 5 million royalty-free images, thanks to iStock image library access. But having a great-looking site won’t do you much good if nobody visits it. Thanks to 1&1’s SEO spotlight, you can easily submit and optimize your site on major search engines, like Google and Bing. Every package also features site analytics tools to show you how changes affect your page’s performance. 1&1’s premium offerings also include advertising credits and mailing list integration, which can attract new and returning customers. If you get into trouble, 1&1 offers 24/7 phone and email support to answer all of your questions. Whether you have a question about the company’s offerings or about something technical, you should find the courteous assistance you need with 1&1. 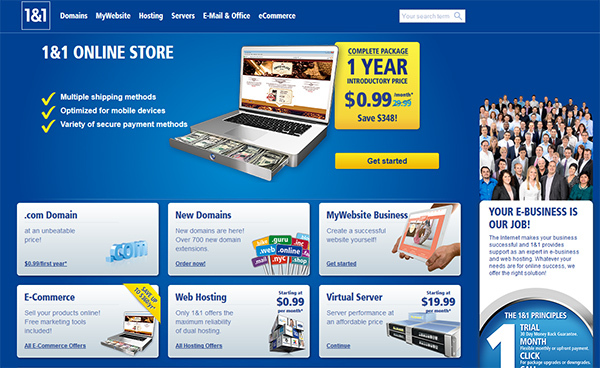 You’ll also have access to 1&1’s online help center for how-to guides on all of your webhosting needs. This knowledgebase also features a myriad of video tutorials to show you what steps you need to take. With an introductory rate of $0.99/month for your first year of hosting, 1&1 will certainly raise some eyebrows among skeptics. Yet, this basic hosting plan offers many of the essential features that first timers will need to get going. It’s also important to bear in mind that 1&1’s services are fully scalable, meaning that you can upgrade your services as your needs increase. 1&1’s upgraded services cost $4.99, $5.99 or $10.99/month for enhanced integration, storage and transfer capabilities. While most webhosting companies either intimidate newcomers or don’t offer enough support for veteran webmasters, 1&1 manages to package together enough features to keep both sides happy. For novice site designers, 1&1’s template-based, point-and-click website builder should be straightforward enough to get you off and running. If you’ve got more experience, though, the full-service features of 1&1’s premium packages should entice you. No matter who you are, you’ll probably notice that 1&1’s 30-day money-back guarantee means you have nothing to lose by trying 1&1 today.